Following the defeat of Bonnie Prince Charlie at Culloden in 1746, British Parliament passed the Acts of Proscription, which forbade, among other things, Scotsmen from wearing their beloved kilts. The law was repealed a generation later in 1782, and Highlanders were allowed to don their traditional costume once again. The Seann Triubhas, Gaelic for "old trousers," was created as a dance of celebration. It begins in slow time, showing the constriction of trousers. Upon the clap of the hands, the music changes into quick time to signify the shedding of the trousers, and the dance steps show the freedom and joy in dancing in a kilt. This dance portrays young women flirting with the Blue Bonnets, a slang term for the Regimental Scotsman, in reference to the blue hats they wore. The Jacobite troops had no formal uniform, so their emblem became a white cockade on a blue bonnet. Legend has it that this originated when Bonnie Prince Charlie picked a wild rose and pinned it to his hat. The words to the tune were written by Sir Walter Scott. This graceful National Dance was invented for female competitors at the Aboyne Highland Games, which to this day prohibits female competitors from wearing the kilt. Now danced to the "Battle of the Somme," it is a combination of the Highland and Ballet forms of dance. Always danced to the famous tune of the same name, this dance originated with soldiers during the First World War. Unlike most national dances, which are usually danced in an Aboyne dress, the Hielan Laddie is performed in the standard kilt-based outfit. The Gillie Callum has its roots in ancient battles. Instituted in 1054 by Malcolm Canmore, King of Scotland, the dance became a ritual for warriors prior to battle. Performed over a crossed pair of swords, the dance included an element of fortune-telling: if the warrior touched the swords while dancing, it was believed that he would be wounded in the ensuing battle. If he kicked them apart, he would surely die. This dance is performed in honour of Flora MacDonald, who helped Bonnie Prince Charlie escape to the Isle of Skye following the massacre at Culloden in 1746. Disguising him as her maid, Betty Burke, Flora was able to see to it that the Prince escaped safely to France. Legend has it that Flora fell in love with Prince Charlie, and she danced this dance for him high on a hill as his boat set off for France. This is one of the first dances students learn. It involves the first step of the Sword Dance. Watch this favourite character dance closely, and you will see the sailors perform daily tasks such as climbing ladders, coiling rope, hauling cables, and standing on lookout duty. This was traditionally a victory dance warriors and clansmen performed on their small round shields, called the targe. Most targes came equipped with a sharp six-inch spike protruding from the centre, so a careless step could be a bit painful! It's easy to see how much dexterity a dancer needs to perform this properly. The Irish Jig is a character dance that tells the story of a Irish washerwoman who, in a rage, chases children through the village after they�ve pulled her laundry from the clothesline, dirtying and muddying her linens and clothes after she�d spent the entire morning at work. The jig parodies Irish dancing with similar leg movements and hard shoes as the dancer chases the children, flounces her skirt, shakes her fists, and stomps her feet. The dance became enormously popular in minstrel shows after a performance was featured at the 1876 Centennial celebration in Philadelphia. The famous Highland dancer, judge, and examiner James L. McKenzie was so enthralled with the cakewalk when he watched it during a trip to the United States around the turn of the century that he brought it back to Scotland with him, where its fame spread throughout the Highland dance community. Today the Cakewalk mimics the pomposity of a promenading aristocratic couple, and, unlike other Highland dances, features inventive costumes and themes. Wilt Thou Go to the Barracks Johnnie? A national dance, "Wilt Thou Go to the Barracks" originally served as a recruitment dance for the Scottish Army. Recruiting officer would use dancers to attract people to the recruiting station, or use the dancer for entertainment while stationed in a village. The movements of the dance represented the strength, agility, and determination a soldier would earn while undergoing military training. "Barracks" is commonly danced to the pipe march, "The Barren rocks of Aden" or "Braes o' Mar." 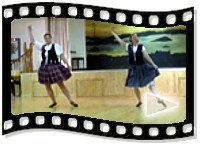 Unlike most national dances, which are usually performed in an Aboyne dress, "Barracks" is danced in the standard kilt-based outfit.